Powerful Gear – You may get raid loot from the chests after successfully completing an encounter but it is not guaranteed (sometimes the chest do not drop any loot). Tokens that you may use with Benedict-99 at the Tower is the main way you will obtain raid loot. Tokens – You will receive reputation tokens from each encounter in the raid. Visit vendor Benedict 99-40 in the Tower after you have completed the raid to rank up and earn raid specific rewards. If you are in a clan and your clan completes a raid with at least 3 clan members, you will be able to pick up one raid engram per week and per account with Hawthorne at the Tower. Raid Chest Keys – Drops at each encounter, except Calus. Remember to use keys before each reset as they will be removed from your inventory every reset. These chests can drop legendary and exotic engrams, tokens, and other items however they do not drop raid specific loot. Legendary Engrams – Engrams can drop from enemies in the raid. During this encounter, there are about 3 key differences. All players will have to run the inside area. After a player has completed running on the inside they will be deemed worthy and cannot run/pick up the orb again. Due to this new mechanic ALL 6 players must run ONE time each, there’s a total of 3 cycles before the final running phase all players participate in. Two Psions appear on the outside instead of one. >> One psion you will need to melee and other psion you need to shoot, the psions you shoot are called ‘projections’ like the ones inside the Shadow Realm at Calus. Kill adds like normal when starting each phase (just be a bit more cautious, adds deal more damage). 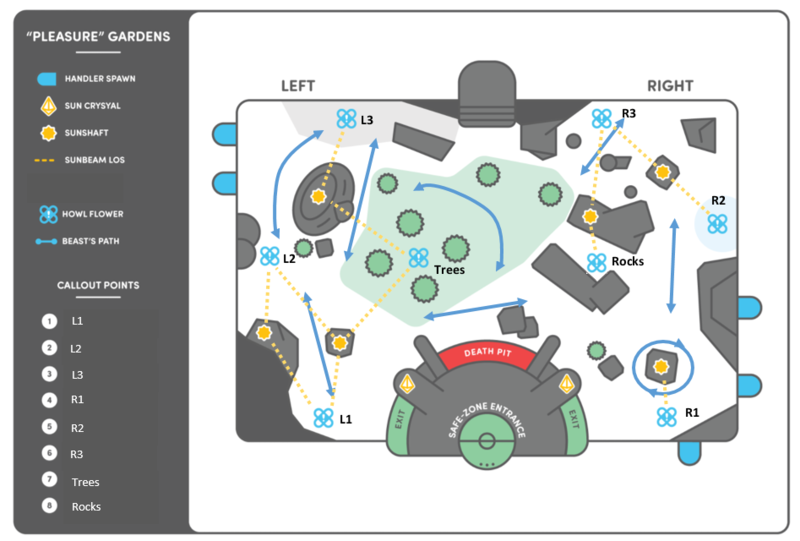 2 players (the ‘runners’) grab their orb to run in the inside area, once the runners jump through the circle outlined in red, two Psions will spawn outside (instead of just the one psion you normally melee). You will have to melee the first Psion as usual and then shoot the projection psion. If you miss either one, your team will wipe. How my team ran this: My team split into 2 groups of 3 and we pretty much move with the person running inside. Before we started, we assigned who would run 1st, 2nd, and 3rd for each of the two teams/sides. Then we assigned 2 players on each side outside an arrow to always shoot (top or bottom) for that phase. One person on each side on the outside is also always assigned to melee the psion in the bubble for that run cycle, while the other player moves to the next plate and that player is assigned to shoot the projection psion (the player that melee the first psion can help shoot the projection while moving to the next plate to shoot an arrow). Just communicate and coordinate things and it should go smooth. There is other methods to this encounter too, this is just how we ran it. Three Orbs only spawn on the final run! Everything is the same on the final running phase where all players run inside except there’s only 3 orbs to grab at the end instead of 4 like on normal mode. Two Extra Beasts have been added > Total 8 Beasts. The only main change here is that 2 extra beasts have been added. One of the new beast spawns on the left near the second flower (L2) and the other beast spawns on the right in the cave area (cave). How my team ran this: First we had the two players assigned to shooting the flowers and the player that leads below learn the paths of the new dogs, so we wiped about 2-3 times so they could learn both sides and make sure we knew what to expect. (Once a map is made with the two new dogs it will be added here) After that, we assigned each person a dog to kill on their own. We basically split up into 2 teams (left and right) and then assigned one player to one dog each per side. All 3 players on each side kills their own dog and then goes to the extra dog (L2 or Cave) and kills it with the team mates on their side (be careful not to rocket yourself as there could be small dogs and adds nearby). After assigning dogs, we assign one player to being the ‘leader’ for below (all players below follows this player and mimics the leader moves). Once we got enough of the buff, we all went to our assigned dogs (rocket launcher and grenades like pulse grenades work very well), after we killed our own assigned dog, we moved to the extra dog on our assigned side and all worked together to kill the extra dog on our sides. 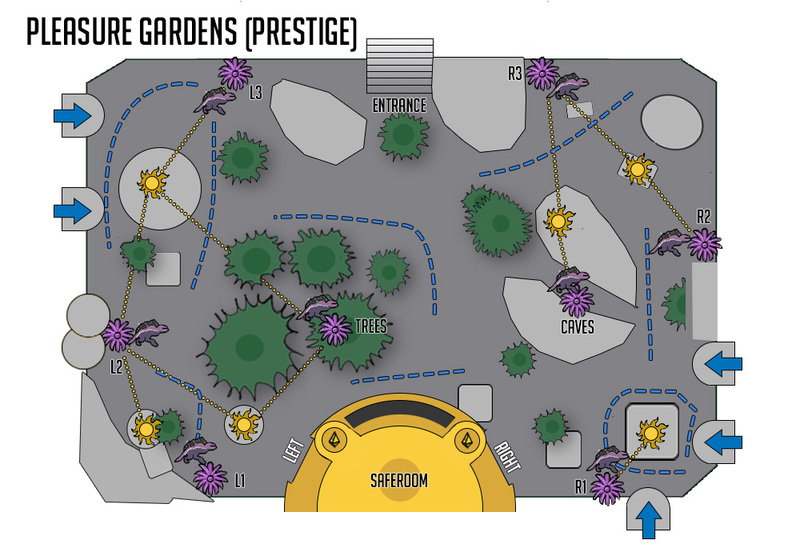 We were able to one phase the dogs/pleasure gardens encounter after coordinating and planning the prestige mechanics. This fight is way harder than normal mode. First, the enemies take and deal much more damage, and the new “Oiled Ceremonial Bathers” are bullet sponges. When they die, they drop an area-of-effect damage that will take away five of your Psionic Projection countdown per second instead of one like normal. Once the phase is finished and players move to the middle to damage the purple lanterns, a ton more adds will spawn, including constant Bathers who must be focused down. Try having at least one member of your team using a Super at all times to focus on adds while the rest of the team stands in the middle and shoots the lanterns. Notes/Tips: You will really want to work well with your team, on this encounter you must be very safe and on top of killing adds. Try not to leave your plate to get the protection buff if there are adds remaining, it will only make it harder for your teammate taking over your plate and could cause them to die which will eventually cause a chain reaction for your whole team. Make sure to kill adds while staying in cover as you move to the middle to get the protection buff, leaving adds in the middle will definitely cause your team to die. You can move off your plate for a bit to get in cover from adds and the bather but do not stay off it too long or it will make it take longer to get the damage phase which will make things so much harder for your team (especially because it is very hard to come across power ammo). Rocket Launchers (some like Merciless), Pulse Grenades, Hand Cannons, and an Auto Rifle setup is a great loadout for the Oiled Bathers and adds (weapon loadout example: Better Devils, Uriel’s Gift, and the Raid Rocket Launcher or Curtain Call). Work together, do your best to stay safe and alive, and try to remain calm! If you one phase lanterns you will be able to skip the new mechanics for gauntlet prestige mode. Adds will spawn like normal, and players are teleported into the darkness realm like normal. But the big change here is that when a player in the throne room melee their corresponding Psion, they will be teleported back into the darkness realm with a random player from that area switching spots with them and taking their place in the throne room. Notes/Tips: Having a warlock with a healing rift for inside is so helpful for inside the Throne Room. Try to team fire adds and the majors (orange bars) as a team, use supers when needed to clear out the Throne Room so your able to take out Calus’s shield when the time comes without adds shooting you. As far as the ‘Shadow Realm’ look at what your symbol is, shoot the psions on the ground immediately, and the shoot the projections floating above the ground in the bubbles. Make sure to call out your symbols loud and clear and not interrupt team mates, try to have a plan such as calling out symbols from left to right. Remember as soon as someone inside melees a psion they will be teleported into the Shadow Realm and a random person will be teleported into the Throne Room, try to not let this confuse you. Completing this encounter on normal mode a few times is key to understanding this encounter and may be best if you haven’t completed it before doing prestige.